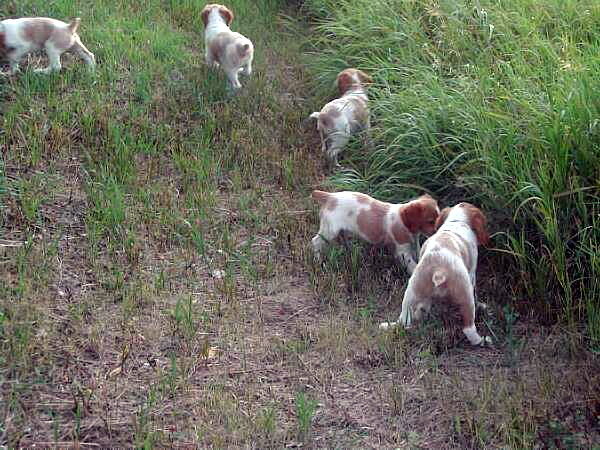 At Prairiestorm Kennels each breeding is carefully planned and researched in order to ensure that the puppies we produce are genetically sound, healthy, of exceptional temperament, and have natural hunting ability. 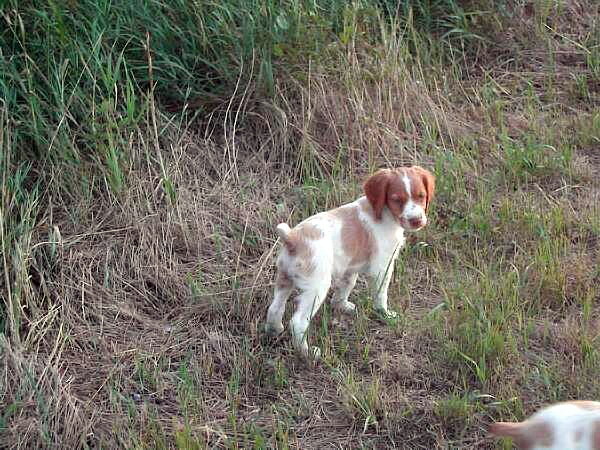 We strive to produce puppies that will make loving and calm family pets, great hunting partners, and excel in hunt tests, obedience, agility, and other dogs sports. 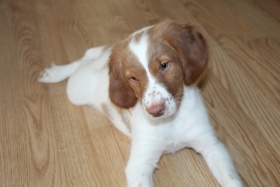 Our goal is to produce the all purpose Brittany Spaniel who will work when asked to, yet would just as happily curl up by your feet. All dogs in our breeding program have OFA certified hips and CERF eye examinations. 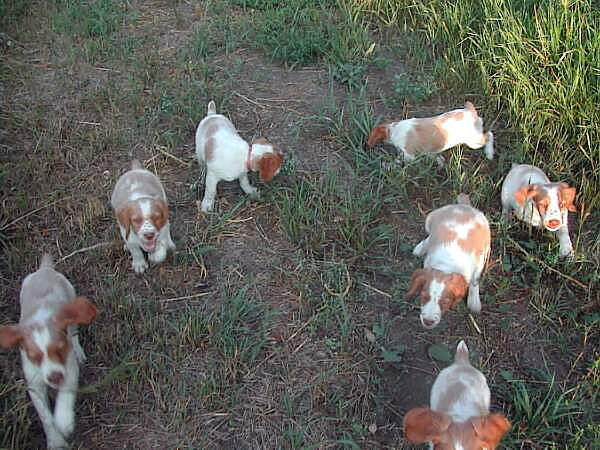 All puppies born at Prairiestorm Kennels are raised in our home, handled daily, and given individual attention. 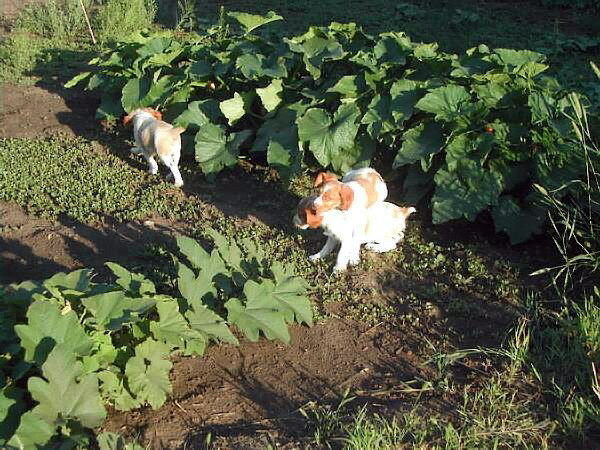 They are extensively socialized with children, cats, and other dogs and started on basic housetraining and crate training before they leave. Puppies are taught to be calm when being held, have their nails cut weekly, are used to having their eyes, ears, and mouths looked at, and are also given baths. They are also introduced to birds, gunfire, and water (weather permitting). Puppy buyers are welcome to come and visit after their puppies are 6 weeks old. 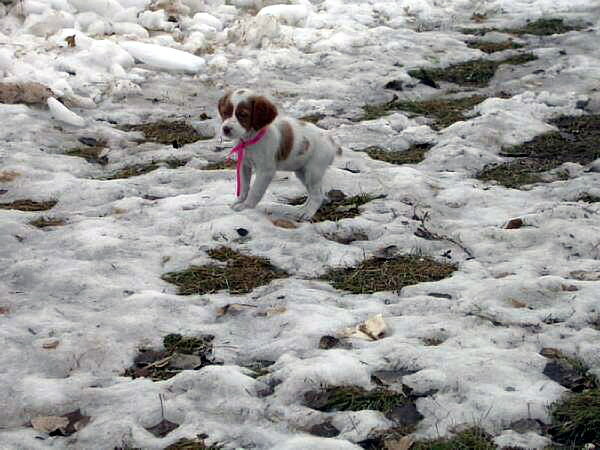 We also send weekly photos and updates of the puppies. Since the puppy's don't develop their individual personalities until about 6 weeks of age that is the soonest that we will begin the process of deciding which puppy would be the best fit for your home and lifestyle. 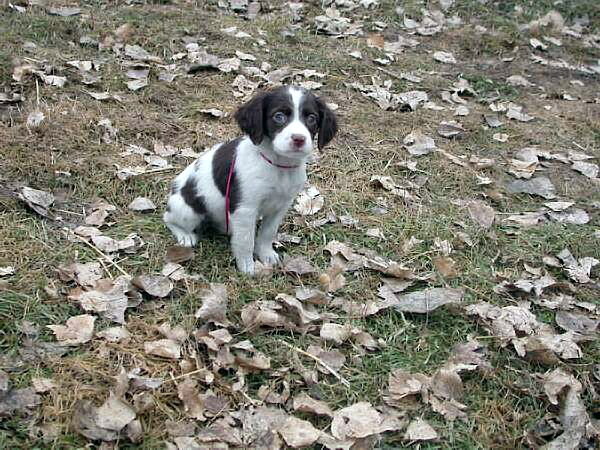 In this regard everyone get the "pick puppy" as that is the puppy that is best suited for your home. We allow puppies to leave for their new homes at 7 weeks of age (49 days is considered the optimum bonding age for a performance dog). 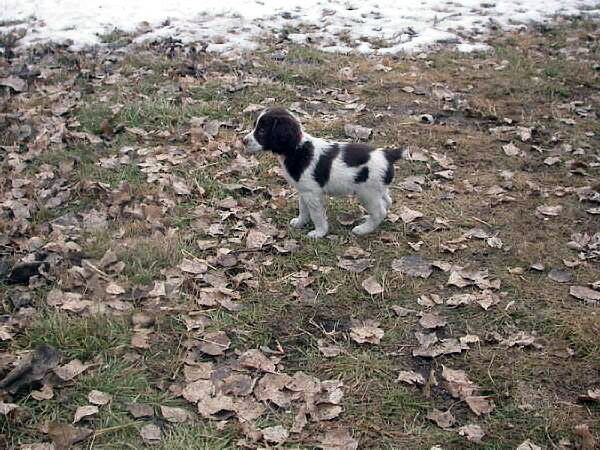 Puppies are started on solid food at 4 weeks of age. We feed and recommend Boka Chicken and Oatmeal. We also recommend supplementation with Glucosamine HCL, Vitamin C, and Missing Link Skin & Coat Supplement for the first 2 years of your puppy's life. 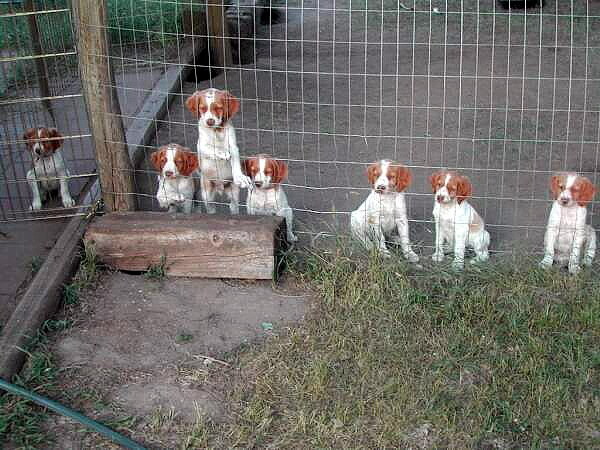 Puppies are fully weaned from their mothers at 6 weeks of age. Puppies are sold for $1200 plus GST (a $200 nonrefundable deposit is required to be placed on our waiting list) and are CKC registered, tails docked, dewclaws removed, tattoed or microchipped, dewormed every 2 weeks, have their first vaccination, and are health checked by the vet. Puppies are sent home with an information package. Our puppies come with a 30 month written guarantee covering hips, elbows, and eyes and a 12 month guarantee covering other genetic disorders. 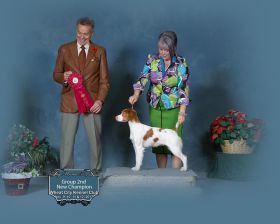 All puppies are sold on a CKC nonbreeding agreement. 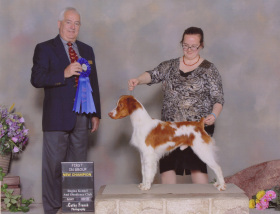 We may offer breeding rights on a case by case basis to established breeding kennels who have titled and health tested dogs and maintain high breeding standards. Please contact us with any additional questions or to place a deposit on one of our current or upcoming litters. We welcome visitors. Please call ahead to schedule an appointment. We will consider co-ownership homes for some of our younger male and female Brittanies and for a couple of our middle-age male dogs. The dog would live in your home and return to us when needed for breeding purposes. Homes must be located about 45 minutes of Saskatoon. Please inquire for more information. 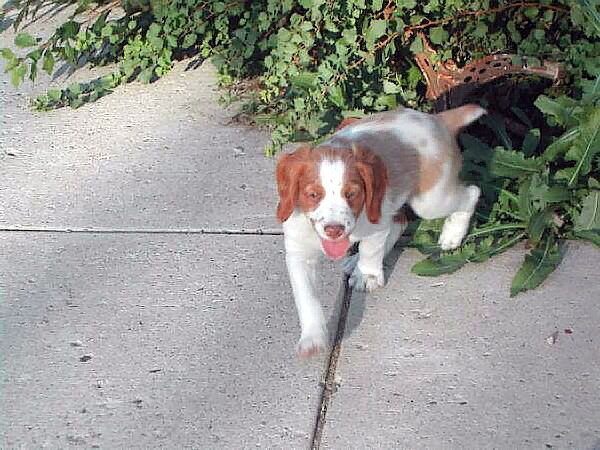 Pyro's Mr. Teal: 12 week old male puppy. Has had 3 vaccines. Very friendly and gentle and loyal. Great with cats, other dogs, and children. Has an overbite where his teeth don't line up properly. He is priced accordingly. Please contact us for more info.